The Su-15 aircraft combined with its Oryol-D58 radar and R-98 missiles formed the Su-15-98 interception complex and was operated within the Vozdukh-1 ground controlled incept (GCI) system of the Soviet Air Defence forces (PVO). Entering service in the 1970s the modernised Su-15TM version was equipped with the Taifun-M radar and R-98M missiles, forming the Su-15-98M complex. The Su-15 together with its bigger brother the MiG-25 guarded the Soviet airspace throughout the 1970s and 1980s until gradually replaced by the more capable Su-15TM and later the MiG-23P, which also meant the end of further Su-15 developments. 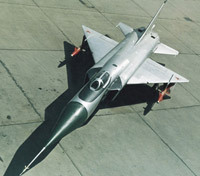 By the end of the 1980s all older Su-15 and Su-15UT versions had been withdrawn from service, by then also the MiG-31 and Su-27 advanced interceptors had entered service. However most of the Su-15TM fleet were not replaced but scrapped in the early 1990s as required by the Conventional Forces in Europe (CFE) treaty. 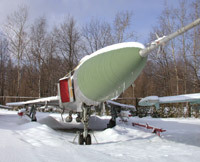 A total of 1290 aircraft were produced between 1966 and 1979 at the state aircraft production plant in Novosibirsk, a small number continued service in the Ukrainian Air Force until 1996. The aircraft was liked by its pilots for its safety, resulting from its two engines, automatic landing approach system and light handling. However it became also infamous because of its involvement in dubious shoot-downs of several civil airliners, in particular KAL007 which killed 269 civilians. The Su-15 has a classic mid-wing monoplane layout with a highly swept delta-shaped wing and tailplane. This layout is very similar to that of its predeccessors Su-9 and Su-11 as well as the contemporary MiG-21. The Su-15 different from these designs by having two engines and lateral air intakes. 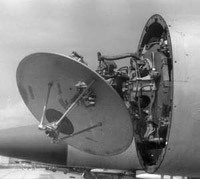 This arrangement of the air intakes was needed to enable the use of a larger antenna for the radar, needed to increase the detection range of the radar. The R-11F2S-300 turbojet engines were arranged side-by-side. The tricycle landing gear consisted of a front leg with a single wheel retractable into the fuselage and main carriage consisting of single wheels, which retract inwards into the wing compartments. Late production series Su-15 received a number of aerodynamic changes to improve handling characteristics during take-off and landing. The new wing features a greater surface area and the other sweep angle was decreased to 45 degrees, resulting in the so called 'cranked-delta'. The new wing reduced the landing and take-off speeds as well as the induced drag in flight. NATO recognised the rewinged aircraft as 'Flagon-D'. The aircraft also received a UPS boundary layer control system and R-11F2SU-300 engines adapted to the UPS. The UPS system blowns air from the engine compressor to the surface flaps, enabling higher deflection angles of the flaps, 45 for landing and 20 degrees for take-off. However the engine compressors delivered insufficient power, and deflection remained limited to 25 and 15 degrees respectively. Apart from new weapons and avionics, the 'second stage' Su-15T/TM received also the new R-13-300 turbojects. The R-13-300 was more poweful and slightly improved acceleration and range. It also enabled full use of the UPS system. The air intakes were slightly bigger to accodomate the greater airflow required for the R-13s. The aircraft also received a longer front undercarriage leg to improve wing incidence at take-off and reduce the danger of foreign objects damage (FOD). Late production Su-15TM received ogive shaped radome (bullet shaped) replacing the more aerodynamic cone design. The cone shape caused the more powerful Taifun-M radar to produce inner reflections of the radar pulse in the nose. The Su-15 was equipped with the Lazur-S (ARL-S) command datalink, the onboard component of the Ground Controlled Intercept (GCI) system. The ground based operator could transmit commands via UHF radio or via the encoded datalink. In case of the datalink, the Lazur-S would receive, decode and transmit the commands to the pilot in the form of course, speed and altitude indicators as well as single message as 'afterburner on', 'radar on' etcetera. After having been guided to the target by GCI commands, the target could then be engaged using the Su-15's onboard radar. The Su-15TM was equipped with the Lazur-SM and SAU-58 automatic control system enabling fully automatic mode in which the modernised Vozdukh-1M GCI system directly transmitted commands to the aircraft's control, without pilot intervention. The automatic system could guide the interceptor to the target, engage the radar, launch the missiles at the target, exit from the attack, return to base and enter landing approach to an altitude of 50-60 meters. Late production Su-15TM were fitted with the modified SAU-58-2, which was able to read low-altitude radio altimeter data. The Vokdukh-1M GCI system could now guide the Su-15TM at low altitude (200 meters) and intercept low-flying targets, which could not be tracked by the Taifun radar because it could not distinguish targets against the ground background. But pilots refused these low level flights with the Su-15TM. By now the MiG-23 with Doppler radar had become available and developement ceased. Other avionics included IFF, Sirena-2 (Sirena-3 on Su-15TM) Radar Warning Receiver (RWR), and navigation equipment. 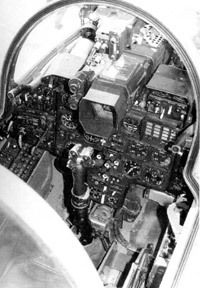 The cockpit is fitted with the KS-4 ejection seat designed by Sukhoi. In the top center of the instrument panel a single hooded display is located for the radar. A simple K-10T sight is installed to aim the R-69 missiles and cannons. The Su-15UT and Su-15UM are two trainer variants, with the cockpits placed in tandem, although with seperate canopies. For communication between the cockpits an intercom is used. The instructor cockpit also features a retractable periscope providing forward vision for the instructor during landing. The Su-15 carried two medium range air-to-air missiles of the K-8 (AA-3 'Anab') family on underwing PU-1-8 (later PU-2-8) launchers. The K-8 range of missiles were developed as part of the interception system aimed at destroying enemy bombers. Although the Su-15 as part of the Su-15-98 was originally intended to carry the R-98 (K-8M2) missile, initially the R-8M1 (K-8M1) was also used. With the Taifun-M radar, the Su-15TM was equipped with the improved R-98M (K-8M3). All of these missiles were available with IR or semi-active radar seeker, normally the Su-15 is seen carrying one of each variant. Later the IR-guided R-60 short-range missile was added to the Su-15s inventory by adding two small innerwing pylons. The underfuselage pylons were replaced by the BD3-59FK type, enabling carriage of the UPK-23-250 gun containers as well as a number of unguided air-to-ground weapons. The new PU-2-8 pylons could also carry unguided air-to-ground weapons. However the Su-15 lacked the fire control systems needed for effective delivery of these against ground targets. Butowski, P., V. Pankov, V. Ponomariev (1994). Sukhoi Su-15 'Flagon', Aircraft Monograph 1, AJ Press, Poland. Butowski, P. (2001). Sukhoi Su-15 'Flagon', International Air Power Review vol. 1, AIRtime Publishing, USA. Gordon, Y. (2004). Sukhoi Interceptors, Red Star Volume 16, Midland Publishing, UK.